I seriously could eat this lemon curd by the spoonful. I found a microwaveable recipe over at Real Mom Kitchen. It was so easy and so good. I will be making this again without a doubt. The first night it was PERFECT, not too tart, just right. The 2nd night, after sitting in the refrigerator, it was a little more sour than the first night and it might make you pucker a little, but oh I loved it! I used my lemon curd for some LEMON PIE BARS. I found this idea in a new cookbook I just got the other day. The picture looked so yummy. 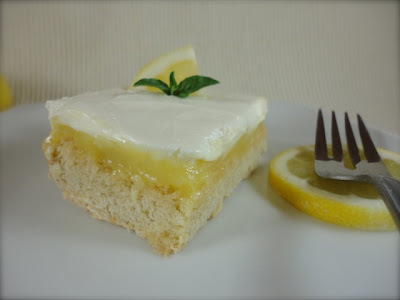 They use a sugar cookie crust and top it with lemon curd and whipped topping. Honestly, the bars didn't turn out as good as I had hoped. I overbaked my sugar cookie crust, so it was a little dry and it turned out thicker than I had wanted, but oh well, that hasn't stopped me from eating them. In a very large microwave-safe bowl, whisk together the sugar and eggs until very smooth. Stir in the lemon juice, lemon zest and melted butter. Cook in the microwave for one minute intervals, stirring after each minute until the mixture is thick enough to coat the back of a spoon, about 4 minutes total. Remove from the microwave and place a piece of plastic wrap directly on the surface. Cool for one hour. Store for up to three weeks in the refrigerator in a sealed container. It will thicken a little more once it has been refrigerated. Yield: around 2 cups. Cream together the cream cheese, yogurt, marshmallow cream and vanilla. Fold in the Cool Whip. Refrigerate until ready to use. Jenn's Notes: I cut the lemon curd recipe in half. I used 3 1/2 lemons to get exactly 1/2 cup of lemon juice. I had to stop and stir my mixture every 30 seconds, because it was getting so hot that it was overflowing my microwave-safe bowl. So, make sure to use a very large bowl or you will have to stir it every 30-45 seconds. For the bars, I used a homemade sugar cookie crust (you could always use store-bought if you chose to make the bars) The whipped topping is delicious. I think if you folded the whipped topping into the lemon curd it would make an AMAZING dessert. It would be great layered in a trifle. If you love Lemon desserts, then I know you will LOVE this lemon curd!!! I've made a very similar recipe, it was so easy and so tasty! This sounds so easy and love microwave recipes! Thanks for sharing! Thank you so much for sharing on Momtrends. I love checking out all the Friday Food submissions. Yep, I could eat lemon curd in vats too. Have a great weekend and thanks for sharing. we are hosting a lemony luncheon next week! i will have to try this recipe! I always make my lemon curd on the stove, but maybe I'll give the microwave a try next time. PS I didn't have cake for dinner, but I *did* have pie for breakfast this morning! Oh yum! These look wonderful! I just added these to my pinterest page. Thanks for linking up with me for Friday Favorites. I saw the pic of microwave lemon curd and decided to read the recipe.You have shared a good recipe.My husband is going to like this recipe.